There are thousands of people who live in remote areas and have to home school their children. There are also thousands who live in cities and suburbs and who actually chose to home school. And throughout my travels, I have discovered another large community which is sailors. It is quite surprising the number of families that live on sail boats (or other types of boats) and travel around the world. Here’s a blog from one such wanderer “Floating Classroom“! Here in Belize, my neighbors at the Barton Creek Outpost also home school their children. I didn’t know anything about home schooling until I moved to Barton Creek. It got me curious and I did some investigating. I have found that there are just over 1 million children in the United States alone who are being home schooled. There are many good websites who provide incredible tools and resources, so anyone can entertain the thought of homeschooling. Personally, what I would fear the most (if I had children) is the discipline and will it must take… one of the parents becomes a teacher. Imagine going from “mom and daughter” to “teacher and student”. The first thing you have to do is get yourself organized. Study and reading material, reference books, and worksheets, supplies etc. are some things you gather before you move as during the move, and the adaptation period, things will get busy! Having an organized schedule will make your life much easier and will also help keep the kid(s) in a structured environment. Planning for 1 month or 6 months takes about the same time, so plan for at least 6 months. I found good resources for schedule templates, curriculum, worksheets and many other teaching aids. 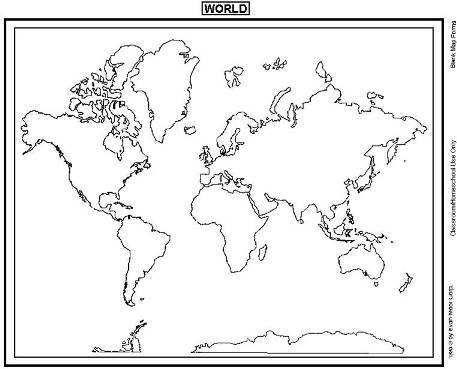 Below is a printable blank world map for Geography homework I found at Home Crusaders Website. Books and all the material are heavy and bulky. A type of carrying case I recommend is a sturdy shipping case or plastic bin with seal. It is extremely practical as it seals against the element so you keep the moisture (and crawly critters) out to preserve things vulnerable to humidity. And it also can be used as a table wherever you are at. If you will have internet access at home, it makes things easier as you do not have to carry as much. In most places you can find internet cafes. Depending on the frequency you can visit the café is another important factor in your overall organization and material gathering. And of course there are thousands more. There are also a lot of blogs solely about homeschooling. Blogs can be very good sources as they are written by individuals who are living it. Their writing is true and real as they are not doing it on a business point of view, but for sharing with others. Also, joining an online group or forum is always a good idea for help and support between members. And last but not least, is to schedule exercise time. Not only is it essential for the kids, but it is also very good for you! Here at Barton Creek, playing in the creek is the best gym. I do not have children, but exercise daily while playing and spending time with the dogs. With areas from ankle deep to a 15’ swimming hole it is the best way to end a hot day in the jungle! The Federal government did a study about five years ago and found that the number is closer to two million. Though there are some reasons to doubt just how confident the number is. I have heard a few scholars claim the number is getting closer to three million. For comparison there are over sixty million students in K to 12 in the US. I noticed on one blog you said you were mennonite and then here you say you use electricity. Are you really mennonite? We are not Mennonite at all. Where did you see that I say we are? What I said is that we live in the heart of a Mennonite community. Hello there, cool site an all. Thanks a lot for taking the time to write such interesting stuff. Keep it up! 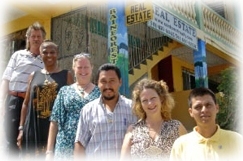 Hi there, we are trying to research moving to Belize. What type of regulations are there on homeschooling there? What standards do you have to meet, and how tightly does the government regulate what your curriculum is? Belize does not have much regulations at all, and I don’t know if there are for homeschooling. And often the regulations they have are not reinforced and pretty much ignored. The best thing to do is check with local schools and government officials. Here’s a link to the “Government Website” . As American Citizens we pay taxes no matter if we are in the U.S. or abroad. Concerning the benefits, are they the same, no matter if we are in the U.S. or abroad? Specifically, are American Citizens living abroad entitled to allowances for home schooling? Are they entitled to some other benefits? Wouldn’t it be reasonable to eliminate discrimination? Thank you! As a Canadian, I don’t know the US law regarding taxes. I would suggest you consult an Expat Tax Consultant. A website full of information for expats is http://expatwomen.com/ where you can find one. I would also guess that the US law must also vary from each states. So maybe find a tax expert in your State would also be a good solution. Have a great day and have fun “somewhere in Europe”!!! I’m not positive, but by “entitled to allowances for home schooling” are you asking if you would be given a tax credit if you homeschooled in Belize? I’m afraid you would not be given a tax credit if you homeschooled in the U.S. We have homeschooled our daughter for eight years so far, and I can assure you that in the U.S. we do not get any tax benefit for homeschooling. We can’t even get the $500 allowance that public school teachers get if they spend their own money on school supplies ~ and we spend more than that each year on our curriculum! And yes, we continue to pay huge property taxes to support the public education system in our state. Every state in the U.S. has their own, very different, requirements for homeschooling. Some have very little oversight (Texas for instance), while some have much, much more. The only benefit I can see to homeschooling outside the U.S. would be that you could potentially be out from under the more autocratic requirements of some of the states. This blog is absolutely incredible. Very informative. Thanks a lot. Do you still liven Belize? Would you recommend an expat have the Mennonites build his/her home? Thanks a lot.